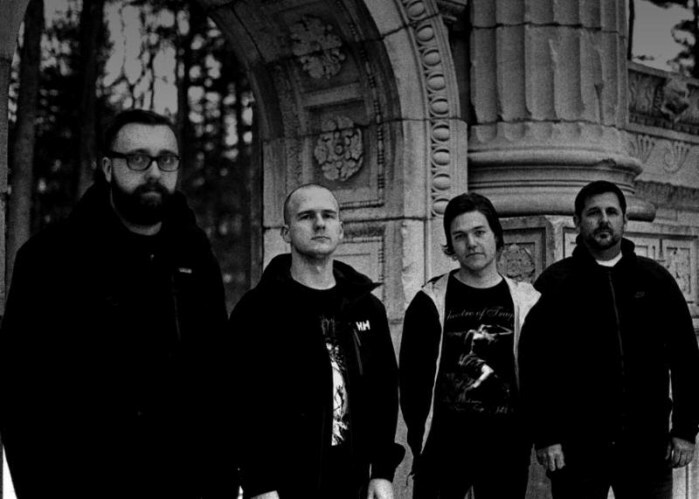 Though Tomb Mold have been on the scene since 2016—releasing a couple of fantastic demos that year—they didn’t really take off until the release of their debut album, Primordial Malignity. Their Finnish death metal meets weirdo, off the wall riffing style really connected with people and their debut ended up being one of the most beloved death metal records of 2017. Tomb Mold emerged as a fully formed unit, sounding practiced, tight, and knowing exactly what type of band they wanted to be. You probably wouldn’t blame Tomb Mold if they wanted to rest on their laurels for a couple of years before recording a follow-up to such a well-received debut. Instead, Tomb Mold decided to record an album that is bigger, better, more detailed, and more accomplished in just about every way—15 months later. The basic parts of Tomb Mold have not changed on this album. They still are deeply devoted to a low-end heavy death metal sound. For those lovers of prominent bass, thou shalt not be disappointed—Tomb Mold keeps the bass very loud and prominent in the mix, with a rubbery tone that adds to the weird, alien sound of their music. As far as guitars go, the riffs continue to be a mix of savage, Finnish death metal and odd, coiling riffs that you’ll be hard pressed to find anywhere else. The album starts off with these serpentine riffs, played without much distortion, soon to be backed by powerful blast beats, demonstrating right away the way that Tomb Mold combines discordant elements to create a sound that is unlike anybody else in death metal right now. Another great example is the exotic riff around the 3:00 mark of “Abysswalker” that only lasts for about 15 seconds. It would almost be a throwaway if it weren’t so compelling. A band that I don’t often see Tomb Mold compared to, but I find to be an apt comparison, is Demilich. Tomb Mold are nowhere near as technical and overwhelming as Demilich, but both bands are good at creating riffs that sound like they come from another universe and couldn’t be made by anyone but their respective bands. Outside of the weirdo riffs, Tomb Mold sure can create a straightforward, elephantine racket when they want to. The riffs that are more on the traditional Finnish end of things are totally crushing. The intro of “Gored Embrace (Confronting Biodegradation)” gives a good example of these riffs. Another facet of Tomb Mold that makes them sound unique is the guitar tone. While the bass rumbles beneath everything, providing the meat of the sound, the guitars have a strange tone that can sound savage when chords are being played, but sounds surprisingly light when riffs only take place on a single string. It is both warm and discomfiting. Even though the guitars are excellent, the highlight here is the drumming. 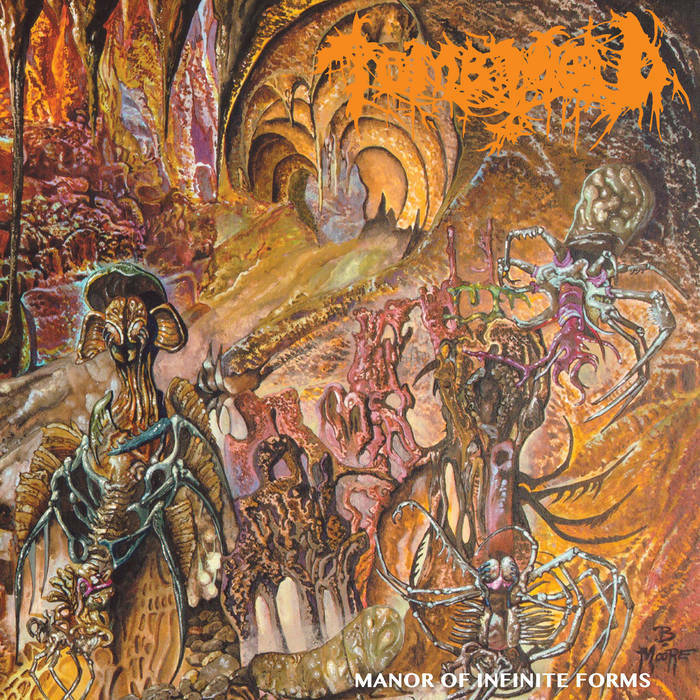 Though Max Klebanoff put on a great performance on their previous recordings, he puts on an absolute masterclass of death metal drumming on Manor of Inifinite Forms. Right from the oddly forceful intro to the album that only lasts about two seconds, one can tell that Klebanoff is a special drummer. What might be the most astounding is his stamina. The man never seems to slow down, seemlessly shifting from delirious blast beats to skank beats to more rock-oriented fair to double bass beats, connecting them all with inhumanly powerful fills. The aforementioned “Gored Embrace…” might be the best show of his talents, where he does everything I just mentioned in a span of almost six minutes, with some incredibly nimble cymbal work for good measure. Throughout the album, Klebanoff strikes a beautiful balance among groove, forcefulness, technicality, and plain out catchiness. A breathtaking drum performance. Klebanoff also takes on vocal duties. These are nowhere near as impressive as his drum performance, but they fit the music well. He almost exclusively uses a toneless, low roar. Though you won’t be writing any letters home about his vocals, I think Klebanoff adds a frightening, inhuman aspect to the album that works well with the unusual tone of Tomb Mold’s music. Though all of these elements were present on Tomb Mold’s debut, here they are blown up to cinematic proportions. You might notice that the song lengths are significantly longer than the debut’s tracks. This allows Tomb Mold to create more of a narrative with their songs. Both within and across tracks, everything feels more connected, like these songs were written and ordered in such a way to take one on a journey through twisted death metal heaven. Riffs are tied together with excellent transitions and songs ebb and flow in a logical order, starting off with the introduction to the chaos that is “Manor of Infinite Forms” and ending with the monolithic closer “Two Worlds Become One.” The latter begins with a lovely acoustic intro, signaling that the end is nigh. After the intro, the next six minutes or so are some of the most punishing music on the entire album, and the song ends with Klebanoff reaching for the exosphere with his malicious howl while the band strikes a mid-paced dirge for the end time. Tomb Mold have managed to create another excellent album, one that improves upon just about every aspect of their debut while extending their sound to be more panoramic and detailed. A stellar sophomore effort from these Canadians that will resonate through the stars until the next time they decide to grace us with their music (hopefully in another 15 months). This entry was posted in Death Metal, Featured Review, Reviews and tagged 20 Buck Spin, canada, Death Metal, featured, Finndeath, Manor of Infinite Forms, Tomb Mold.